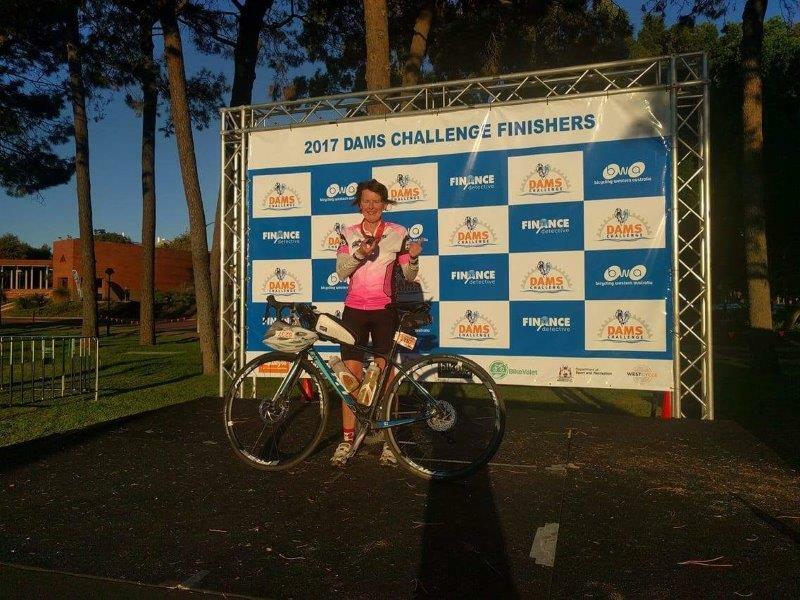 I had originally entered the 3 Dams as I had unfinished business from a couple of years ago when I entered but then pulled out before the event. Then I changed to the 5 Dams event the day before, after being inspired by the distances being ridden daily by the riders in the Indian Pacific Wheel Race, and as a tribute to fallen rider Mike Hall. The 5 Dams riders rolled out at 6 am from Curtin University in groups of around 20 riders, leaving every 30 seconds. I joined up with a group containing Belle and Stephen, who Monica had put me in touch with the night before. I stayed with this group until we hit Greenmount Hill, where we began to string out as people climbed at different speeds. We rolled through Mundaring and turned at the lights to head down to the weir. It was here that I began to feel the first twinges of fatigue in my legs. Hmm – I’ve only done 40k – shut up legs, you still have a long way to go. 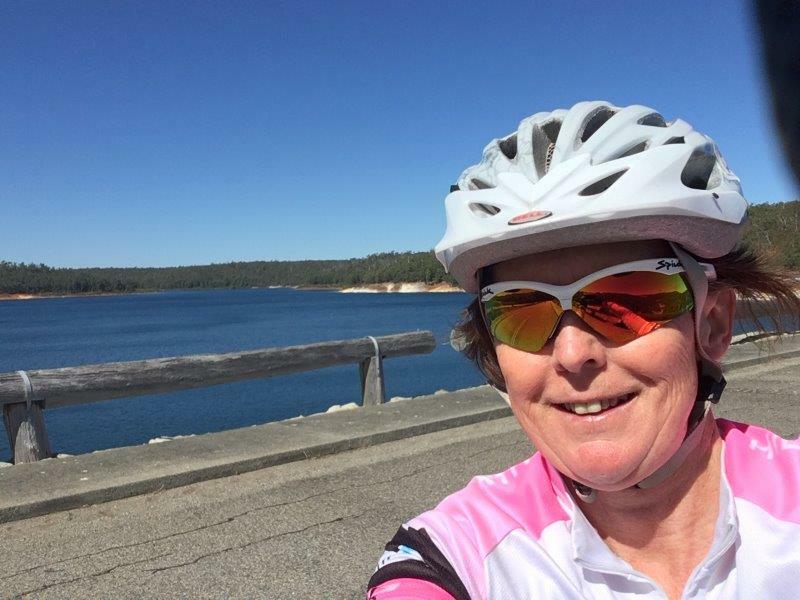 What followed was a nice 7k descent to Mundaring Weir which had my legs feeling good again. A quick stop, refill the bottles, eat a banana, go to the port-a-loo, then I was back on my bike and heading up the hill. My group had all split up by now, so I rode on my own but there were always other riders around, and the faster 3 Dams riders were coming past me now too. The next checkpoint was Churchman’s Brook at 84k. The 3 Dams riders had turned off earlier, so there were fewer riders around me now as I climbed the hilly road up to Churchman’s Brook. A quick stop here to refuel, then off again up an even steeper climb. I am so glad that my new bike has such low gearing. I would really have struggled with my old bike, as many around me did. It was only another 10k to the lunch stop at Wungong Dam, which was 93k into the course. Here we had a choice of filled rolls and banana cake. I ate a cheese and salad roll, and put some cake in my bag for later as I wasn’t that hungry. Another big climb took us up to the dam wall which we then cycled across. This was pretty cool and I stopped for a selfie. More climbing to get out of the dam, whilst the 3 Dams riders came whizzing down the hill on their way into Wungong. It was starting to become hard work by now, and I made sure to eat and drink regularly. I also took an Endurolyte tablet every hour to boost my electrolytes and ward off cramping. I broke the ride into manageable sections between check points, rather than thinking about how far I still had to go. It was only another 17k to the next check point. There’s always time for one more dam selfie! Canning Dam – four down but not yet half way! Next up was Canning Dam, at the 110k mark. To get there we turned onto Albany Highway for a short stretch of a kilometre or two, then turned onto the road to Canning Dam. This road was in poor condition, and was the bumpiest, bone jarring ride ever. As with the other dams, there was a long descent down to the dam, and a long climb back out. Here they served up Winners bars, and I ate one and put one in my pocket for later. I climbed the bumpy road back out towards Albany Highway, feeling the fatigue mounting throughout my body. There were many 3 Dams riders around me on this road, and they too seemed to be suffering in the heat on this awful, bumpy, hilly road. At the junction with Albany Highway, the 3 Dams riders turned right to head back towards Perth, whilst the 5 Dams riders were directed left, to ride 15km along Albany Highway to the Jarrahdale turnoff. This was the section I was dreading the most as I don’t like riding on busy roads, and the memory of Mike Hall’s accident was still fresh in my mind. I hugged the edge of the road as much as possible, gripping the handlebars tightly whenever a vehicle flew past. That 15km couldn’t go by fast enough for my liking, and eventually the turn off to Jarrahdale came into view and I thankfully turned right off the highway. I stopped and had a little stretch here as my lower back was beginning to ache. This section through Jarrahdale and on to Serpentine Dam was probably the toughest for me as it was hot with little breeze and I was beyond tired by this time. Riders were very strung out and at times there was no one else within sight. It crossed my mind more than once that I could call someone to come pick me up when I reached Serpentine Dam if I felt I couldn’t go on. Eventually I reached the dam at 154km and tried to force down some pasta but I was too tired to eat much even though I knew I had to eat to give me the energy to continue. I looked at my phone and had to chuckle when I saw there was no service. I had no choice now but to keep riding. I took a Nurofen and a No Doz tablet, downed a bottle of electrolyte, and set off for the final stretch home. I rode past Karnet Prison Farm, but they were all inside. I enjoyed the fast descent down to South West Highway. OK, I was on the brakes most of the way down the hill to keep my speed in check, but it was a nice relief to not have to pedal for a few kilometres. A short 100m or so along the highway, then we turned right and onto some quiet back roads which were flat and enabled me to ride along at a decent speed. I had been worried all day about making the 6pm cut off, and was very happy to be able to get my average speed up again and try to hold it there. The painkillers and caffeine seemed to be doing their job as I maintained a good speed all the way down Karnup Rd to the freeway where I happily joined the cycle path. To my pleasant surprise, I met two of my friends who had been tracking my progress online and had ridden out to meet me on their bikes. We rode together for a while, enjoying a slight tailwind on the cycle path towards the city. At the 200km mark I stopped at the Freeway aid station, refilled my bottles and ate a killer python to keep my energy up. Steve told me that at this pace I would likely finish around 5.30pm. I was relieved to hear this and kept the pace going. My friends peeled off at the servo and I rode the rest of the way by myself, my spirits having been lifted by their company. The kilometres ticked by, I crossed Mt Henry bridge and onto the path beside the river. I knew we had to ride across the pedestrian bridge to get over the freeway, but I wasn’t looking forward to this as I knew my legs had had it and it would be a struggle. Soon the bridge came into view and as I started up it I noticed a bike coming across the top towards me. It came down around the corkscrew bend on my side forcing me into the railing. I clung to the railing as my legs cramped, and I was stuck – unable to lift my leg off my bike due to cramps. After a few moments I started crab walking the rest of the way up the bridge, then sat on and rode down the other side. Thankfully the cramps stayed away for the rest of the way back along the cycle path to Curtin University. I crossed the finish line and looked at my watch – it was 5.30pm, just as Steve had predicted. My friend Karen was there to congratulate me as I pried my tired body off my bike. I had done it. 5 Dams, 240km, over 2500m of elevation, in 10hrs 18mins. Box ticked – Mission accomplished. How slow do you go? I’m sure that athletes get as sick of coaches telling them to slow down in their easy sessions as we coaches are of saying it. Why is there such an issue with what is fundamentally a pretty simple message? Here’s my take on the situation. The first part of the problem is directly attributable to the coach and their ability to communicate. If the athlete doesn’t understand what the coach is asking they can’t be expected to execute the instruction. It’s one of the reasons why really good coaches are so few and far between, you not only need to have the technical expertise but you need to be a master communicator. Where an athlete has quantifiable metrics that they can use while training (e.g. pace, power and heart rate) the message should be exact. “This is an easy run, hold between 5:50 and 6:30/km” might be the instruction and, hopefully, the groundwork has already been done to give the athlete the skills to execute the session correctly. Other descriptions may relate to physiological feedback such as breathing rate but in my experience using perceived exertion for these easy efforts is futile, athletes ALWAYS get it wrong. If your coach isn’t already giving you precise instructions you need to take responsibility to ask, any coach worth their salt will appreciate that you care enough about following their plan to ask. The second part of the equation is directly down to the athlete’s mindset, easy is just too damn easy. A well executed easy session shouldn’t feel like work at all, you can almost finish feeling as fresh as you started. I can’t count the number of times that I’ve been told “I don’t think I can even run that slow” after setting a pace. Both novice and experienced athletes struggle to come to grips with the fact that something that feels so easy could do any good. We’ve all had drilled into us the ethos of “no pain, no gain” and “hard work pays off.” Now I could go into all of the effects these low effort workouts have (and I have many times before) but most of you would remain unconvinced and head out and do the next session too hard again. Instead I’d like to illustrate with an example of a top level marathoner Yuki Kawauchi. Yuki has a marathon PB of 2:08 and a half marathon best of 1:02, making his threshold pace somewhere just under 3:00/km. So what do you think his “easy” pace would be for his long runs? 3:30/km? 4:00/km? Not even close. Yuki Kawauchi runs his five weekly long runs (typically 20km) at 5:00/km pace! This is the equivalent of someone who runs a 50minute 10km race doing their easy sessions at 8:18/km pace. Now I’m not advocating that our athletes run quite that slow compared to their threshold, I think Yuki is a bit of an extreme example, but the principle still holds. Your easy sessions need to be ridiculously easy, trust me you will reap the rewards in better aerobic fitness, reduced injury and better recovery. So if you’re not coached how do you know what your “slow” is? With cycling it’s tough, unless you have a power meter you really only have heart rate as a reliable indicator and even that is quite variable depending on many factors that are not part of your training. With running though I strongly advocate the use of pace, either by treadmill (boring and often inaccurate), a known course and stopwatch (again boring) or a GPS based device. To get your right pace for any session I recommend the use of the calculator at this page with a recent race result (parkrun is perfect.) Simply enter your time, hit the calculate button and find your training paces. Be disciplined and execute these on training day and I can guarantee you will be setting new PBs throughout next season.